With media personnel being attacked at various districts during the 12-hour hartal by saffron outfits against the entry of two women in their 40s into Sabarimala temple, the Kerala Union of Working Journalists on Thursday decided to boycott BJP and Sabarimala Karma Samithi. The press meets called by BJP state president P S Sreedharan Pillai and Samithi leader K P Sasikala were boycotted by the media this afternoon in protest against the widespread attacks faced by them since Wednesday afternoon. 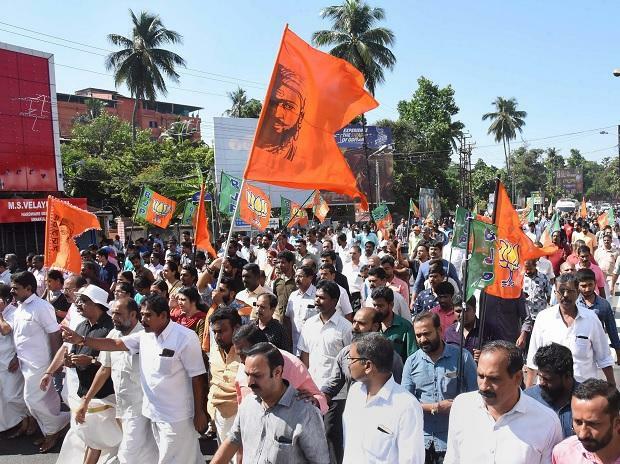 Journalists and camera persons have faced the ire of frenzied protesters of the saffron outfits across Kerala while trying to cover the violence spread by them. The dawn-to-dusk shutdown was called by Sabarimala Karma Samithi, an umbrella organisation of various pro-Hindutva groups, and the Antarrashtriya Hindu Parishad (AHP). Three media persons were injured on Thursday in Thiruvananthapuram alone while covering the violence unleashed by BJP workers on the hartal day. Following this, the Thiruvananthapuram district committee of KUWJ decided to boycott the press meet called by Sreedharan Pillai at 12.30 PM, in front of the Secretariat where the party has organised an indefinite fast for last one month. An embarrassed Pillai was seen giving a speech with just one camera of the Janam TV, a pro-Right-wing channel. At the same time in Kottayam, the press club authorities refused to give its hall for use to Hindu Aikya Vedi leader K P Sasikala, who had yesterday declared a hartal on behalf of the Samiti. BJP state general secretary K Surendran also faced the wrath of the media at Kozhikode, where they boycotted his press meet. On Wednesday, four media persons were attacked by the protesting Yuva Morcha activists, who took out a march against the successful entry of two women of menstrual age group into the Sabarimala temple. Journalists staged a protest march in the state capital on Thursday after they were allegedly assaulted by protesters.